After a long drive from my home in Virginia to Gainesville, FL, I was anxious to get moving and do some visiting. 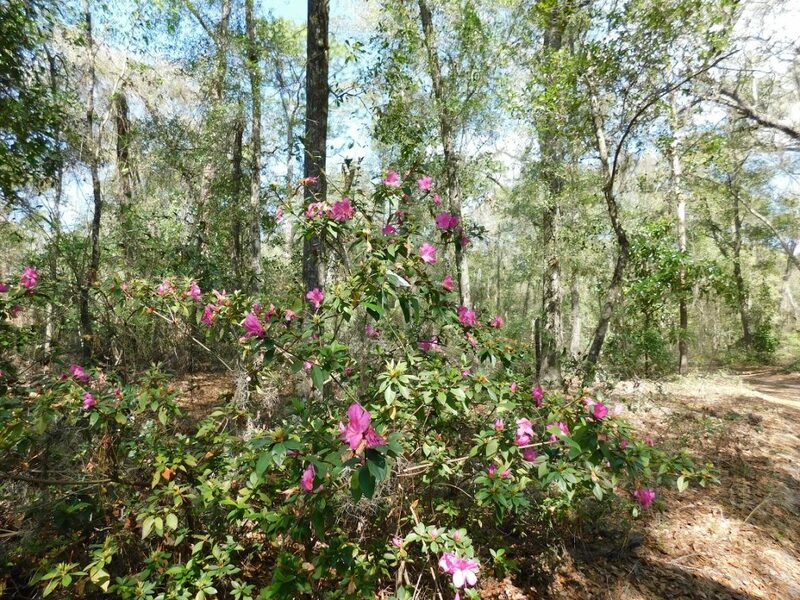 It was a beautiful day, mid 70’s and blue skies, as I headed to Melrose, FL to visit instrument maker David Beede. I’ve known David and his wife Julie for many years, but have never had a chance to visit them in their native habitat! Unfortunately Julie wasn’t home. She is the Volunteer Chair of Education for Sustainable Cambodia and was on a trip to Cambodia. David’s home and shop are in a beautiful location on a small lake. 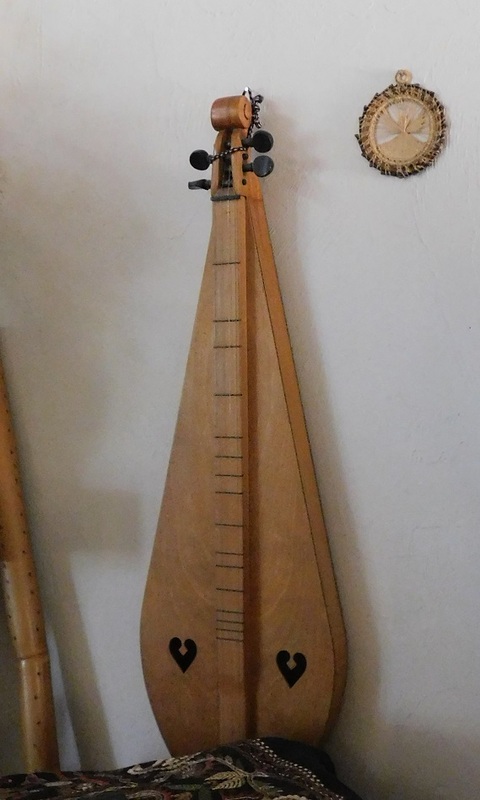 We started the tour in his house where he showed me a couple of beautiful dulcimers he had made, including the first one he had ever built, which had just returned to him from its original owner and is now hanging on the wall. It still looks great. Right up the hill from David’s house is his shop, which is pretty typical of any woodworker’s shop. 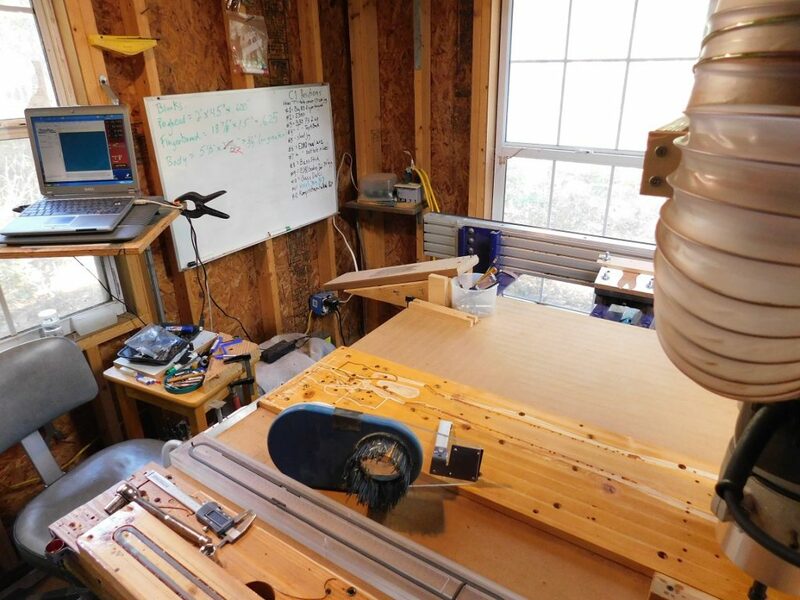 Tools hanging on the walls, racks of lumber, and custom jigs everywhere that he machines on a ShopBot PRS. One thing that might not be quite as common in most shops, but seemed natural to me, is a boat hanging from the ceiling. 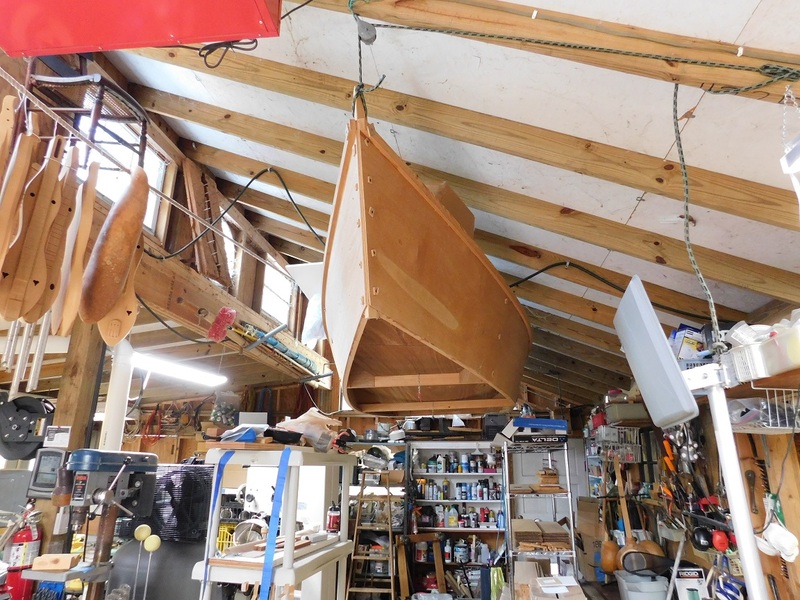 Along with being a world-class dulcimer builder, David is a boat builder and designer. 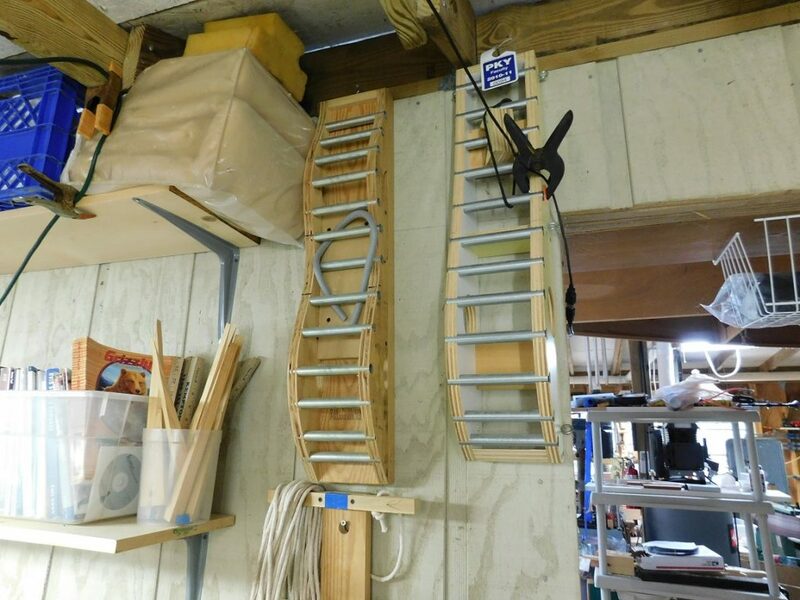 The main shop has the traditional stationary power tools and hand tools you would find in most musical instrument builder’s shops, but in the back is the ShopBot that David uses in all the parts of his building process. This is the second ShopBot David has owned, upgrading from his original PR. 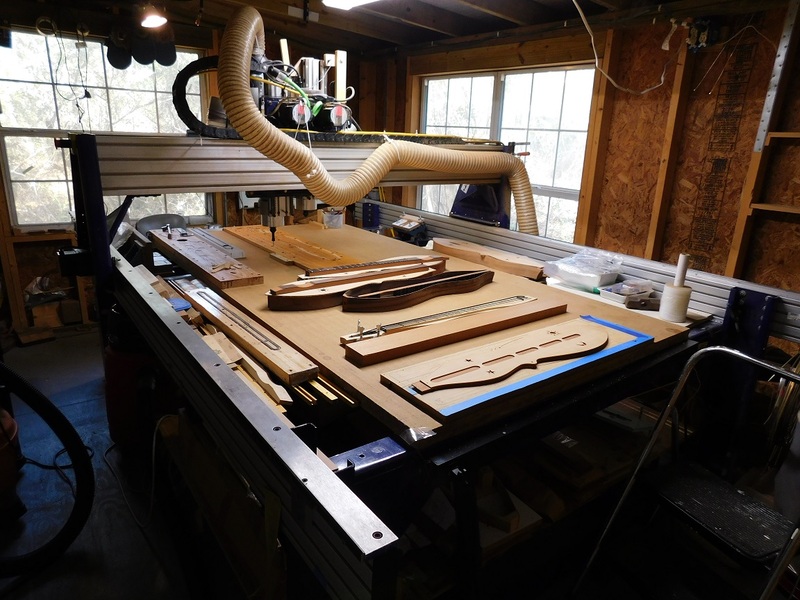 David is an expert at creating jigs and setups to help accurately cut his parts. One of my favorite is an “analog” system for changing the dust collection hose connection for his dual Z-axis tool (as seen in the short video below). Moving an axis up to the top of its motion moves a wooden lever which slides a gate to switch the hose connection from one axis to the other. Very clever! David has automated a lot of his processes using series of custom cuts and macros. 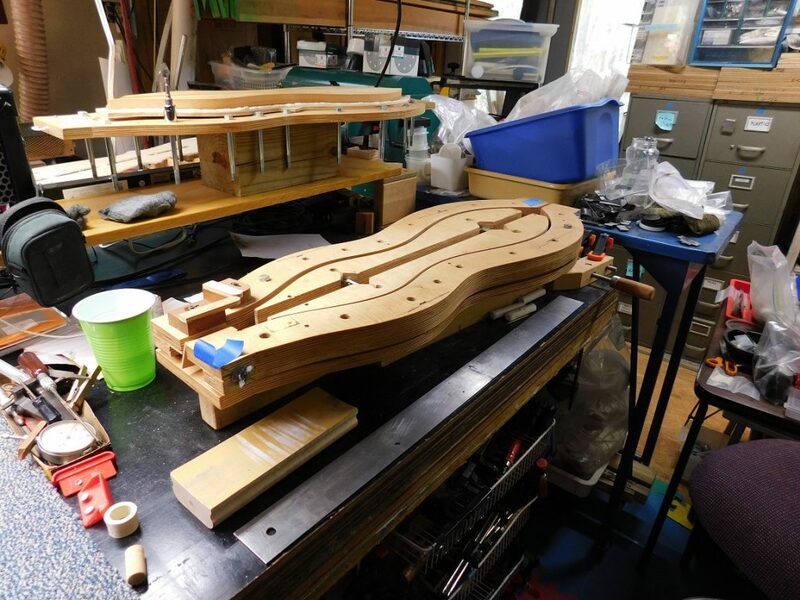 Many of them do accurate repositioning of the cutter to match the location of the jig on his table, allowing him to keep the jigs in place and not to have to keep mounting and re-mounting them. The list of these custom cuts on the whiteboard is impressive! 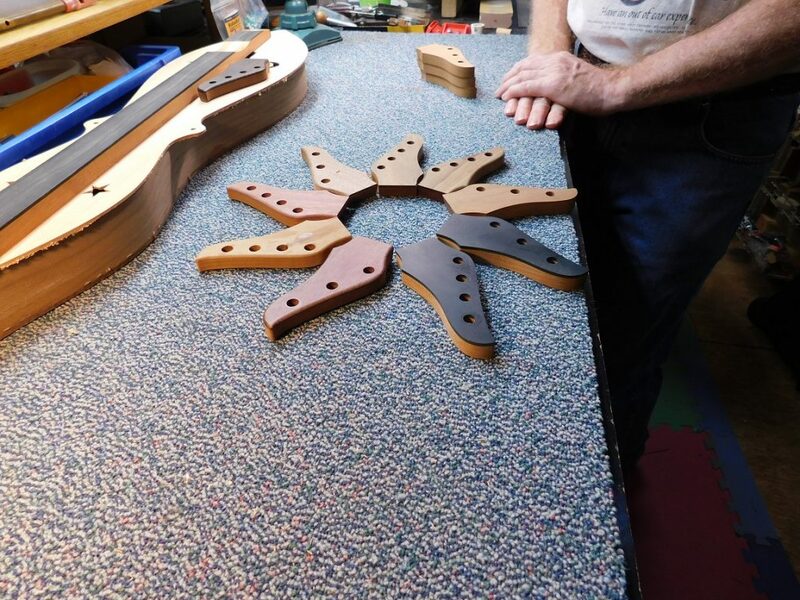 Most of the instruments that David builds are constructed the way a guitar might be, with separate sides, top, and back made from cedar and exotic woods. 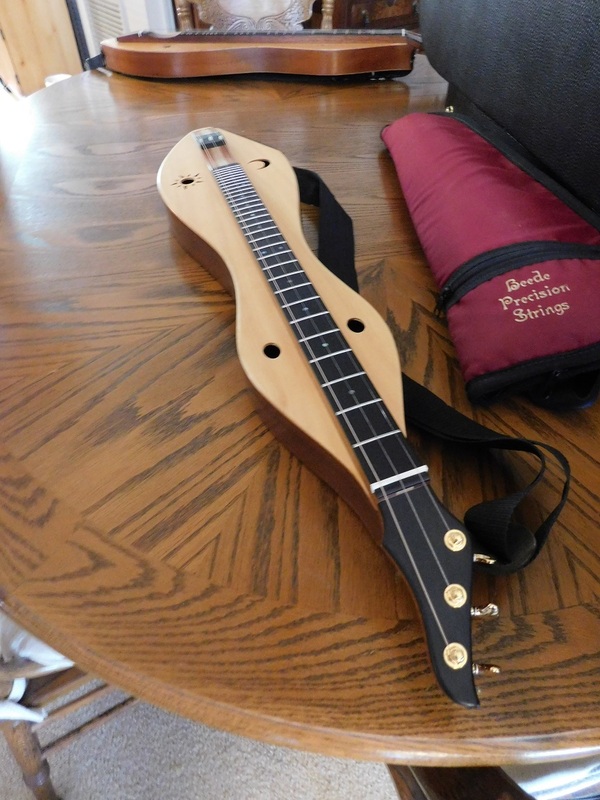 He also, however, makes what is called a “clamshell” dulcimer, which is carved from solid blocks of wood rather than from thin planks and glued together. 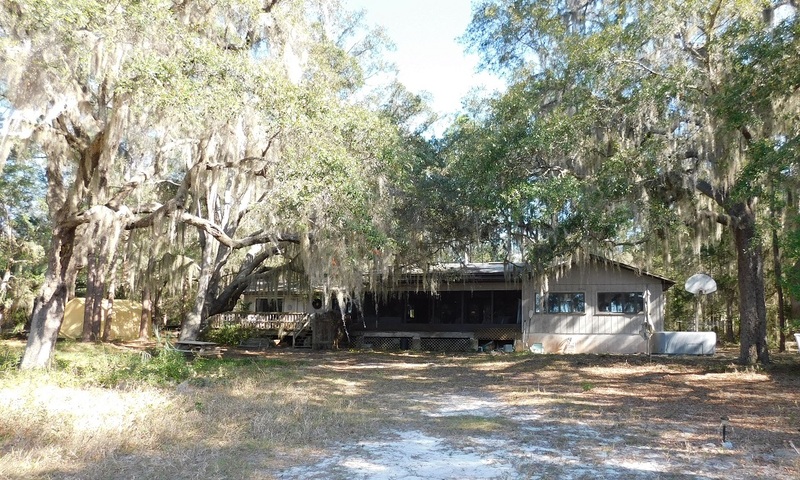 It was hard to leave David’s shop, it was a beautiful location and a very enjoyable visit, but I had another shop to visit about an hour away—Tim Lucas in Bell, Florida.